We offer custom cutting to fit your needs. Whether we use a saw, or shear machine to cut your materials to your specifications, in most cases you'll receive your materials in 'ready to use' condition. 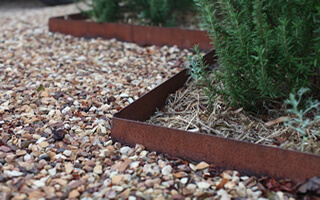 COR-TEN (weathering steel) is used to create planter boxes, edging, retaining walls and sculptures. Often used for decorative landscaped garden areas, weathering steel has a select group of corrosion-resistant alloys so that it’s not necessary to paint the surface. Being exposed to the weather develops a patina that protects the steel and creates a rusty (rustic) appearance that is considered to be quite attractive. 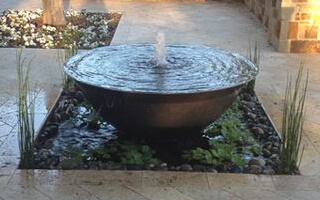 Ideal to be used for Landscape planters, outdoor fountains, fire pits and more! A36 Mild Steel is the most common type of steel available. This steel will rust if left unfinished and give that orange/brown look that is very popular. We stock a variety of sheet and plate in large sizes, as well as precut sizes that are most common for our commercial landscaping customers. This steel is commonly used for planters, edging, retaining walls, and other structural and decorative projects. We also stock flat bars in a variety of thicknesses and widths that run up to 20’ long, perfect for edging.